Location: We visited timber rattlesnake den areas in Arkansas and Wisconsin and met the snake handling church members in the Appalachians. In 1993 Mark was almost killed by a full, prey-taking bite from a large captive canebrake rattlesnake in his care at West Midland Safari Park in the UK. 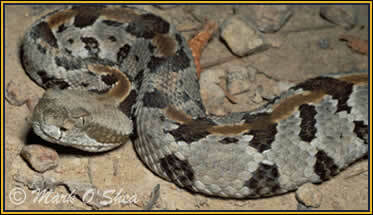 The canebrake is the southern race of the timber rattlesnake although few herpetologists now recognise the two forms as separate. Having experienced the effects of bites by both timber and canebrake rattlers Mark holds a different opinion. The timber rattlesnake was the first rattlesnake encountered by European settlers moving to the USA over 300 years ago and it became a symbol of independence and defiance to the English crown. Flags bearing a timber rattlesnake and the words “Don’t tread on me” were carried by the Americans during the War of Independence against the British and they were flown again during the Civil War when American fought American. 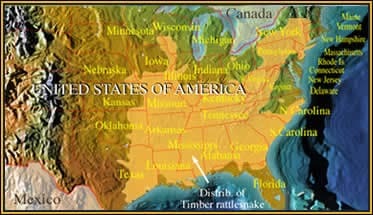 At one time the rattlesnake was the national animal of the USA, until its place was taken by the bald eagle. Sadly this national icon has been pushed to the point of extinction throughout much of its range by indirect threats such as habitat destruction and deliberate eradication due to annual rattlesnake round-ups. Mark visits various locations in Arkansas and Wisconsin with rattlesnake researchers to see what is being done to conserve the last populations of timber rattlesnakes. Steve Beaupre has set up a state of the art radio-telemetry project for rattlesnakes in the Ozarks where the snakes actually record their own data! Some of the Wisconsin locations are deliberately kept secret to deter poachers and the rattlesnake’s human enemies. Mark also visits a West Virginia snake-handling cult, which takes the line from the Bible “Thou shalt take up serpents” literally, and goes snake-hunting with cult handler Dewey Chafin. A close view of a juvenile Timber rattlesnake (Crotalus horridus),note the dark stripe down the back.